There's something I've been considering doing for well over a year now, but I just kept not doing it for one reason or another. However, a couple of weeks ago I finally took the plunge. 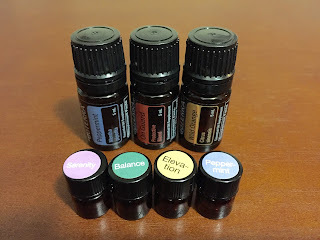 I have read several things online about essential oils over the past couple of years, and even went so far as to look around on the doTerra website, but for one reason or another -- cost, mostly, I guess -- I never did it. I even went so far as to register for a customer ID with doTerra back in July, but still never ordered. But I keep reading Amy's blog and she talks about the benefits of essential oils all the time. In fact, some of her stories almost seemed too good to be true sometimes. I mean honestly ... a drop of peppermint on your temples can cure a headache? Drops of OnGuard on your feet can prevent illnesses? I mean ... REALLY?! The thing she finally got me with was one called Elevation. (The "joyful blend.") The thing is, I have struggled with anxiety and other issues for several years, and it is especially bad during the winter months (which are almost over praise the Lord!). 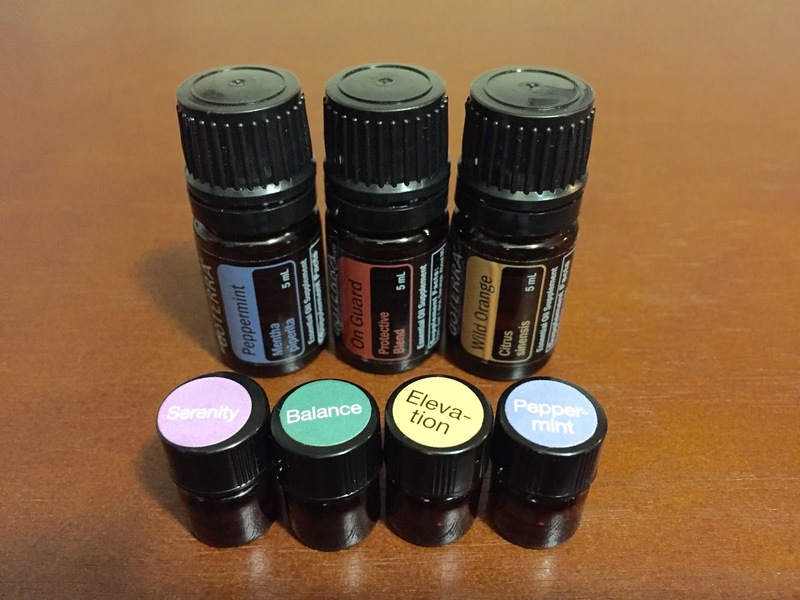 According to Amy (and doTerra), Elevation is a blend that will elevate mood. I am honestly open to anything on earth that will assist with anxiety issues, especially natural things. I finally broke down and went to doTerra's website, committed to trying the oils for real this time. However, I was a little bit taken aback at the $49 price tag on the Elevation. What if it didn't work? What if it was too good to be true? I really don't have an extra $49 hanging around, but I really was so interested in trying the oils! Luckily, I found a "while supplies last" sale on doTerra to buy three of their most popular oils -- peppermint, OnGuard, and Wild Orange -- for only $34. I figured I could try these other ones -- especially the peppermint since I get headaches a lot -- and if they worked, then I could save and invest in the Elevation. I decided to email Amy (disclaimer: I don't really know her in real life, but I think she and I would be friends, and I told her as much in my email :) ) and ask her how to best use the oils. She was so sweet and emailed back right away! She told me that you can really put them anywhere on the body -- and some you can even ingest -- but she recommends putting them on the feet since the pores are the biggest there. She told me to use peppermint often because it would be the one that would really prove to me that oils work. ... and she was SO right. As I mentioned earlier, I get headaches a lot. I take several Advil a week, sometimes more, and I always keep it in my purse. I received the peppermint in the mail about two weeks ago, and let me tell you how many Advil I've used since then: zero. Let me say it again -- ZERO. I'm telling the honest truth. I put peppermint in my handbag and pull it out whenever I get a headache. I rub one little drop (ONE DROP!) on my temples and the cooling sensation sets in almost immediately, and the pain from my headache dissipates. In fact, my friend Sarah was over two Fridays ago -- the day I got the oils -- and she said she had a headache. I said, "Um, I hope you don't think I'm a weirdo, but could I offer you something?" I told her about the peppermint, and she put some on and commented that she really liked the cooling sensation. Just last week my principal was complaining of a headache after school, saying she had taken a couple Advil and was going to take more, and she was getting ready to drive a few hours to a meeting. Once again, I was all like "Um, I hope you don't think I'm a weirdo, but ..." and gave her the oil, too. Additionally, I woke up with some severe back pain last week (never happens to me, must have slept wrong), and it hurt so badly all day that finally, on my planning period, I rubbed a couple of drops of peppermint onto my back. IT HELPED. In Amy's email to me, she also offered to send me any samples of oils I might like to try. PERFECT! I asked her to please send me Serenity, Balance, and, of course, Elevation. (Amy said these are some of her family's favorite oils.) I received those oils a couple of days ago, and WOW. I put Serenity on my feet before bed, and fall asleep easily and sleep so well. I've been putting a couple of drops of Balance on my yoga mat before class. (I want to see if I can dilute it with a little water and put it in a spray bottle so I can spray my mat!) And, of course, I have been obsessively using Elevation since the minute I got it. It must have these warming properties because I feel a warm sensation when I use it. I put Elevation on my feet at night, too, and then I also put it on my wrists and on my heart in the morning. I used it before school last Thursday, and, at the end of the day, I asked my homeroom how their day had been, and one kid said, "The teachers all seemed to be in good moods today. You were really happy this morning." A weird coincidence? Maybe, but I can tell you the ONLY thing different about me that day was that I used Elevation, and this kid has never said this to me before. Here's the thing -- oils are expensive when you first look at them. Like I said, I was taken aback by the cost at first, too. But then I realized that you're really only using a drop or two at a time, and one bottle of oils will last for years. I mean, how much do we spend on prescription drugs every month/year, you know? And if you set aside $35-$50 every month to just purchase one oil, that's manageable. I know I might sound like a huge weirdo, and, I mean, I AM a weirdo, but not because of this. I've been talking to my mom a lot about them, and she's really interested, too. I'm also keeping my sister Erin updated about them (she's the kind of person who would be into this kind of thing, I mean she's a vegan :) ), and she said, "I love that you're becoming one of those people." And I was all like, "Oh I know it. I do yoga and use essential oils." I mean WHO AM I?! But really, the oils are legit. So if you've been thinking about trying them, I highly recommend it. I keep all of mine in a little pouch in my purse (TIGHTLY closed, of course!) so I can pull them out at a moment's notice. I suggest trying peppermint first, as it really is the one that will show you the most immediate results. *Oh, I'm getting nothing for talking about oils, doTerra, or Amy. I just really, really, really like these oils, and I spent FOREVER going back and forth before I ever bought any. I have lots of doterra oils and have been so happy with them. They are magic!